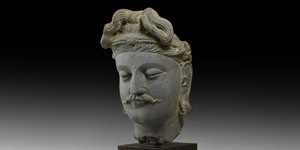 A finely detailed carved schist head of Buddha with detailed carefully dressed hair, clean shaven with neat moustache, braided band to the brow, urna to the forehead; professionally cleaned and mounted on a custom-made stand. 12.5 kg, 41.5cm including stand (16 1/4"). Very fine condition. Property of a London gentleman; previously with central London gallery; imported from the USA in the early 1970s; formerly with Mahboubian Gallery, New York since the late 1960s; accompanied by copy of an early 1970s black and white photograph; supplied with geologic report No. TL005206, by geologic consultant Dr R. L. Bonewitz.